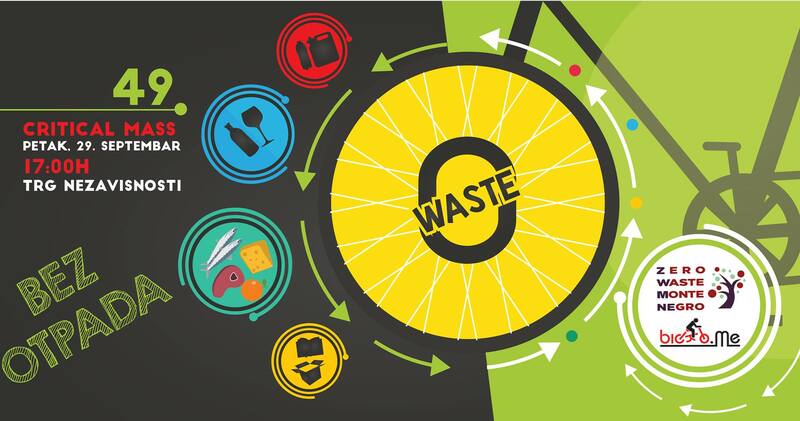 On the 29th of September, Zero Waste Montenegro co-organized in collaboration with Biciklo.me a critical mass event that gather cyclists in Podgorica once a month. The theme of this Critical Mass event is Zero Waste and brought the cyclist to one of the 5 recycling yards of Podgorica. All participants were encouraged to come with their recyclables to bring them to the yard as well as bring their own reusable bag bottle and cup to the event for a refreshing home-made lemonade. It is time for us to announce our joint voyage on the streets of Podgorica, which we organize together with the organization Zero Waste Montenegro. The goal of this movement is to solve waste-related issues, to preserve the environment and reduce carbon footprint. You must have already noticed that the beauty of almost all scenery, rivers, creeks, seasides, are spoiled by some waste. Such negligence seriously endangers the environment: polluting the air, water and soil, disrupts survival of many plant and animal species, increases the risk of flooding and / or fire … Statistics show that in Montenegro there are 155 medium to large unregulated landfills where 60% of waste is collected, and only eight recyclable yards that recycle less than 2-3% of waste. We are inviting you to bring something for recycling (the old cell phone that nobody is using, the food and drink cans, the spoiled charger, the printed volumes that are now collecting dust, useless newspapers or magazines, excess plastic bags and bottles or something), and go with us to the recycling yard in Tološ, so we do not get empty hands as the guests. Take both reusable bottles or cups because we will be honored with good local lemonade. Remember: STOP with single-use plastic products, we will be waiting for you at the Independence Square, where we will start the tour exactly at 17.00. Critical Mass, 49th in a row, begins at 5 pm at Independence Square.